Does your local marketplace have a need for additional first aid training that is not immediately available through the current suite of EFR courses? As an example, is there a local regulatory first aid requirement that businesses or industries require? You may think the EFR program cannot cover these gaps in the market but by using the Emergency First Response Distinctive Speciality route, these gaps may be filled and your first business may indeed grow. So how does the EFR Distinctive Specialty route work? Once you have an idea for your EFR Distinctive Speciality simply download the EFR Distinctive Template, and use it to write your own Distinctive Specialty. The template makes writing your course a very simple process for you. Once you have written your EFR Distinctive Speciality, email it to us for review. A Training Consultant will work with you to answer any questions you have and provide feedback, should your outline need revision. Once you and your Training Consultant are satisfied with the Distinctive Specialty, the Outline, and application, will be submitted to a review panel for consideration. It’s that simple. EFR Distinctives are an excellent opportunity to add something unique, that prospective clients need or want, to your business model and will support your business plans for your EFR business growth. We wish you the very best with your EFR business through 2018 and into 2019! PADI is delighted to announce the new EFR Instructor Trainers in 2018. Programmes have been conducted around the EMEA territory throughout the year and completing the course has enabled these new EFR Instructor Trainers to teach the wide variety of EFR programmes at Instructor level. “The way that the trainer structured the course was done in a really considered way, keeping the timings flexible to allow and encourage discussion on each of the topics and the trainer was able to call on their vast knowledge and experience to answer any questions that were raised as we went along. Once again, a really great day”. We wish everyone the very best of success for the future! Are you interested in growing your business? Become an EFR Instructor Trainer. 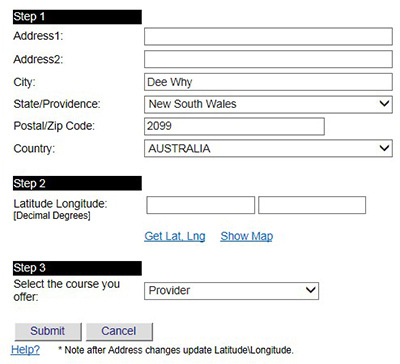 Step 1: Enter the address where your course is located. Your address will be inverse geo-coded by Google to automatically fill in the Latitude and Longitude text boxes. Click on the “Show Map” link and a popup map will be shown so you can double check the Latitude and Longitude text boxes entries. You can also manually enter the course’s latitude and longitude, but make sure that it is entered in decimal format (example: 31.822268, -115.759211). After submitting, the location will save and show up on the Emergency First Response Course Finder Map. Once back at the EFR Course Finder page you can add, edit or delete your courses; note that a maximum of five courses can be entered.